In 2014 Endesa completed the purchase of 2 bcm per year (two million cubic meters) of LNG from the Cheniere Energy project in the port of Corpus Christi, Texas, whose commercial operation is scheduled for 2019, once the liquefaction plant has received the necessary permits for the launch of its first train. For the transportation and management of this volume of purchases, Endesa, which until now had opted to contract LNG with delivery at destination, has embarked for the first time in the LNG maritime sector with the forward contracting of new-built LNG carrier, with the help of Knutsen shipping company. In this way, Endesa manages to cover part of its natural gas supply for the next 20 years with much more flexible and competitive options. Thus, at the beginning of 2018, the construction of the first LNG carrier ‘Adriano Knutsen’ began. It will have a capacity of 180,000 cubic meters (some 72 Olympic swimming pools) and will be completed next July. 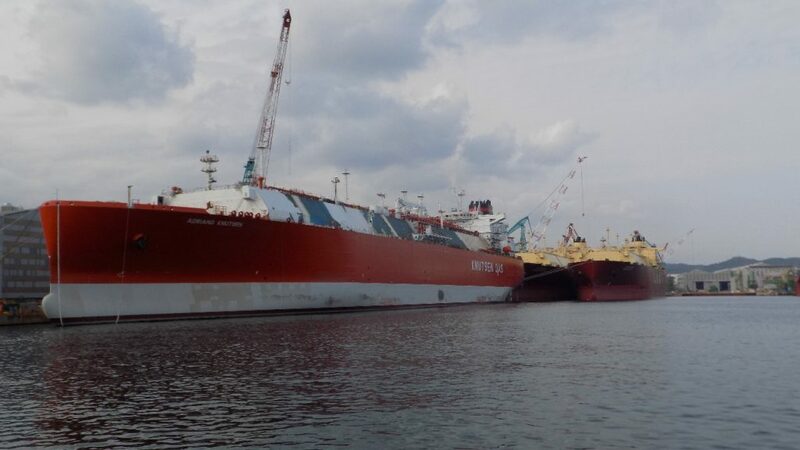 It is a third-generation LNG tanker with total on-board re liquefaction system, owned by the Norwegian shipping company Knutsen Oas Shipping, which is being built at the Hyundai Heavy Industries (HHI) shipyard, the largest shipyard in the world, located in Ulsan (Sour Korea). The charter agreement between Endesa and Knutsen was closed for a period of 7 years, with two periods of extension of 7 and 6 years, which will guarantee part of the maritime transport needs of the LNG purchase contracts for the coming years, from both Endesa and Enel Group. The contract amount is about 25 million dollars per year and the cost of construction of the LNG carrier amounts to about 185 million dollars. The vessel is practically completed, waiting for final auctions and the completion of the sea and cargo tests prior to delivery, which will begin in April. According to the forecasts, the ‘Adriano Knutsen’ will be ready to sail in July 2019. In one year, the LNG carrier will be able to make 12 trips in the Atlantic or 6 transoceanic trips from Corpus Christi to the Pacific. The Spanish-flagged LNG carrier has 300 meters of length, 48 ​​meters of beam (the maximum width allowed to cross the Panama Canal) and 26.4 meters of strut (keel height to main deck). The volume of LNG transported by the tanker, which is stored in a liquid state at a temperature of -160 degrees Celsius in four cryogenic tanks, is equivalent to one day’s demand in Spain or the annual supply of 170,000 homes. The total on-board re liquefaction system allows the vessel to reduce gas consumption and choose the fuel for its propulsion, which may be 100% natural gas or low-sulfur fuel-oil. Likewise, the ship has systems for the reduction of NOx emissions. The vessel will host 26 people: 11 officers (relieved every three months and of Spanish origin) and 13 sailors (of Filipino origin), plus two trainee officers. The first trip will probably be to the United States, where it will make its first shipment. Endesa is a pioneer in the promotion of natural gas in the Iberian Peninsula, a region that has experienced great growth in the adoption of LNG as marine fuel. In this extremely encouraging scenario, AltFuels Iberia 2019 will take place on 11-14 June at IFEMA Trade Center, Madrid.